We set off at 8am again after a yummy breakfast. It was warm overnight and by that I mean we strip off completely as its too hot in our sleeping bags. We start off down one of the biggest hills we climb, and this time it takes less than 1 hour down. We hit the flat ground and little sprinkles rain don’t phase us. Progressively the rain increases out come the rain coats and bag covers. Then bang, thunder lightning and heavy rain. Sleeping bags wet, shoes soaked and legs drenched. It gets colder and we stop into a lodge at TokTok. The lodge is full up of other wet Trekkers and the roof is leaking. We decide to power on to Phakding which is another 1.5hr walk. Some of us are berviuse crossing suspension bridges while lightning is occurring. 5 min before we reach Phakding is starts hailing, RUN!!! With waterproof pants and jackets we are now ready to face the rain. The boys power on while the girls slowly warm up. We stop briefly (less than 1min) to view the hail that covers the mountains and paths. Jill and Kelly are now powering past everyone trying to catch the boys. 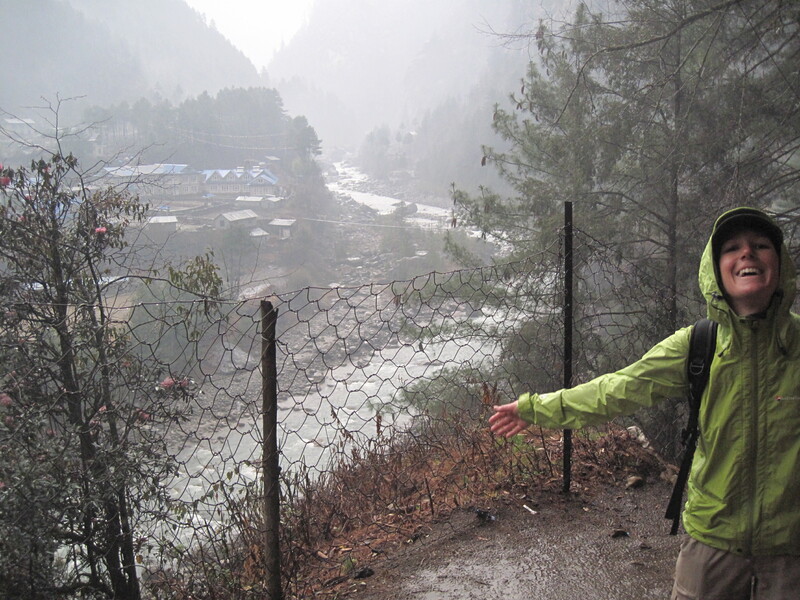 We lose our guides and ask non speaking porters which way when faced with intersections. We are nearly running. 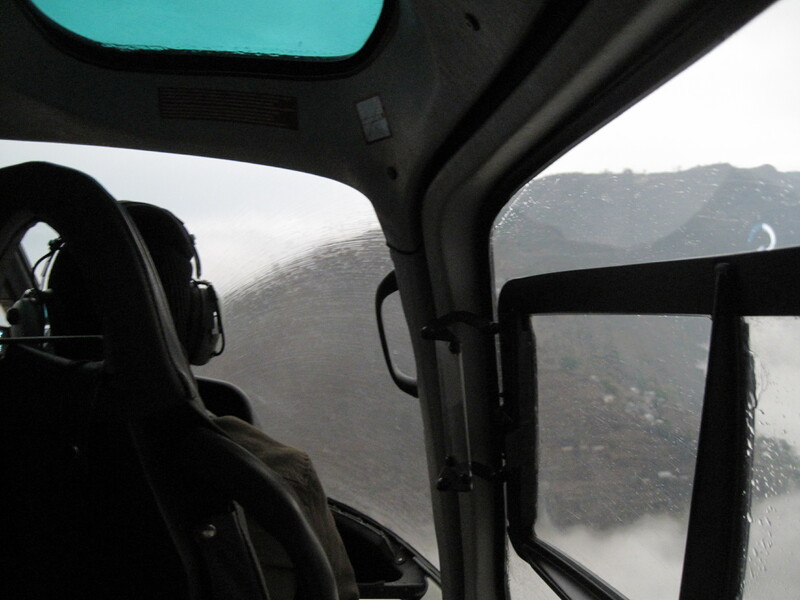 In record time again we make it to Lukla is 2 hrs instead of 2.5-3hrs. For what would have been a boring walk, we had rain to motivate and speed us up. Apparently it rained this day as there were fires in the area and with the smoke rising to the clouds, they become heavier and then rain. 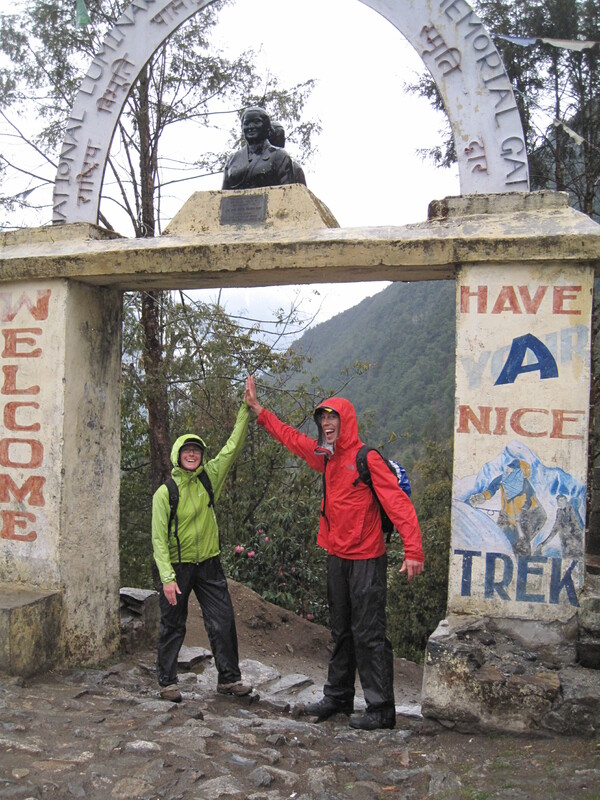 We make it to Lukla take victory photographs. Matt and Jill try to book their plane ticket out of town. With no cash, banks closed and poor weather our opportunity to leave the next morning with our friends was looking slim. 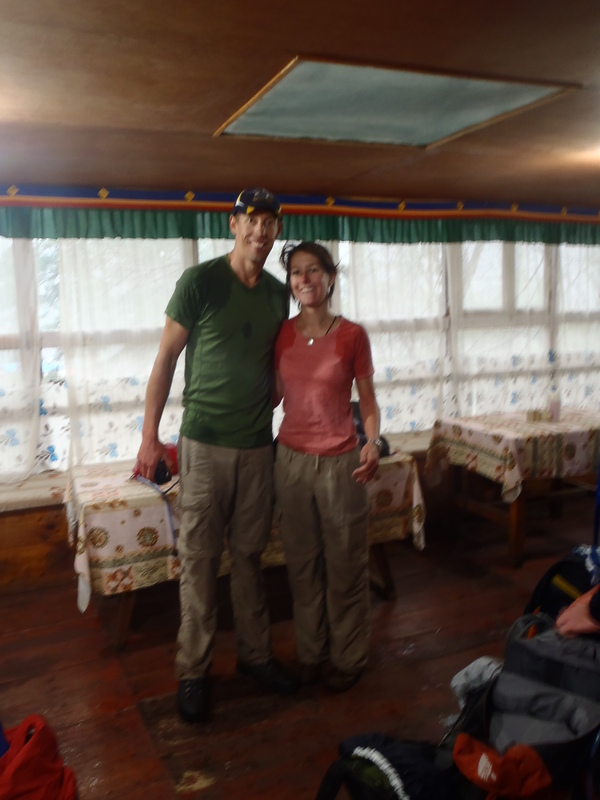 Soaking wet, full of adrenaline we go to our lodge. 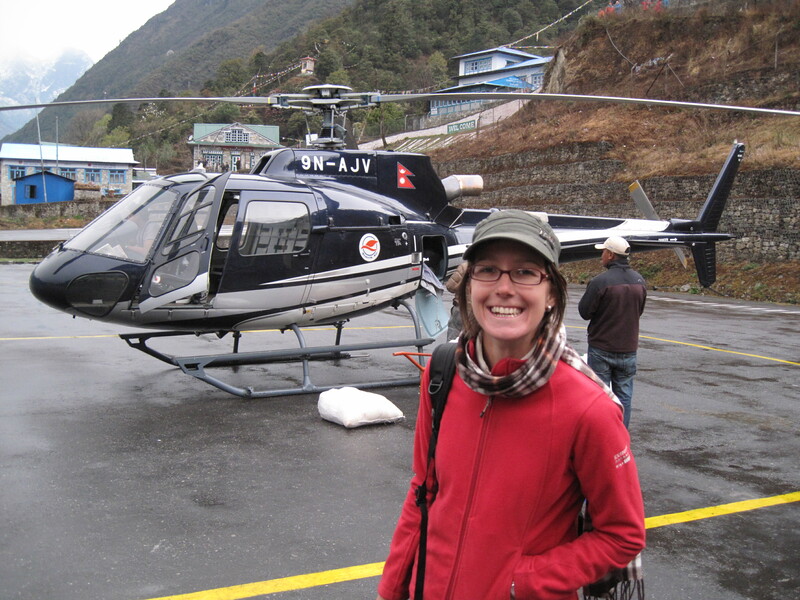 Someone suggests we can take one of the many helicopters back to Kathmandu and pay there. We look at each and nod and smile. We scramble all our cash to make sure we pay Ngima. With enough to pay him, we are able to leave. 40min or so later we are up and away on a nerve racking trip to Kathmandu. With rain, lightning, poor visibility and turbulence Jill sat very nervously. It was reassuring that the guy next to her was an ex military. Before we departed the airport crew informed if bad weather we may be stranded in a small village overnight. Delightful! And my military man said he has only had 1 bad landing in a helicopter but everyone lived. Yeh I am feeling real safe right now,not! But Matt knowing me even better now, knows to feed me snickers as rewards and as a distraction. It worked like a gem. At one point we all looked nervous when heading so closely for a head in collision to a mountain. But we are safe!!!! 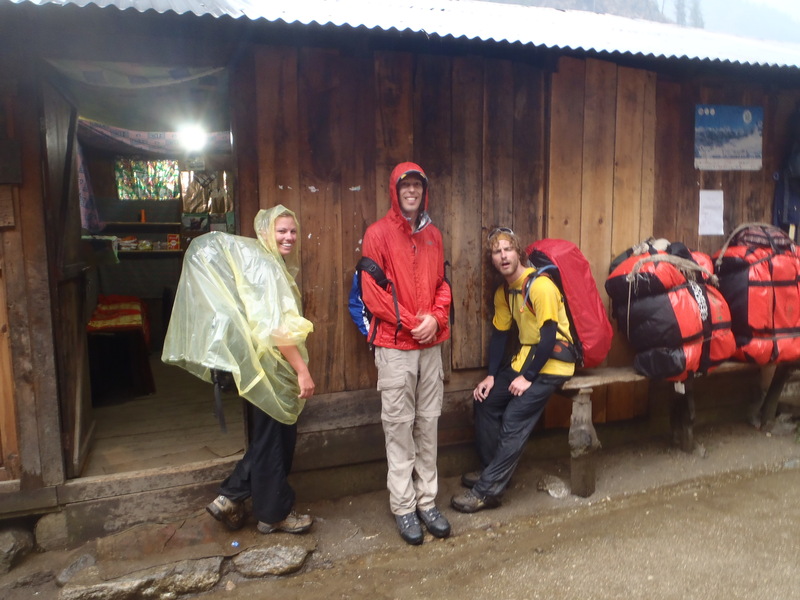 We arrive back to Kathmandu and return our sleeping bags to get our deposit back. Yay we have money again. We arrive back to our hotel wet still and only to be informed that there is only the deluxe room available at $25 / night. We are not paying that, so we repack our stuff so we can go find somewhere else. The man at the reception watched us pack and just as we were about the leave he said we could have the room for 800 ruppees($9.60), done. Dinner then an awesome shower then collapse onto our beds at 10pm. What a day!!! And we are still buzzing. How did all this happen. We are truly awesome creators!!! Best day! Wow! Sounds like an amazing trek. 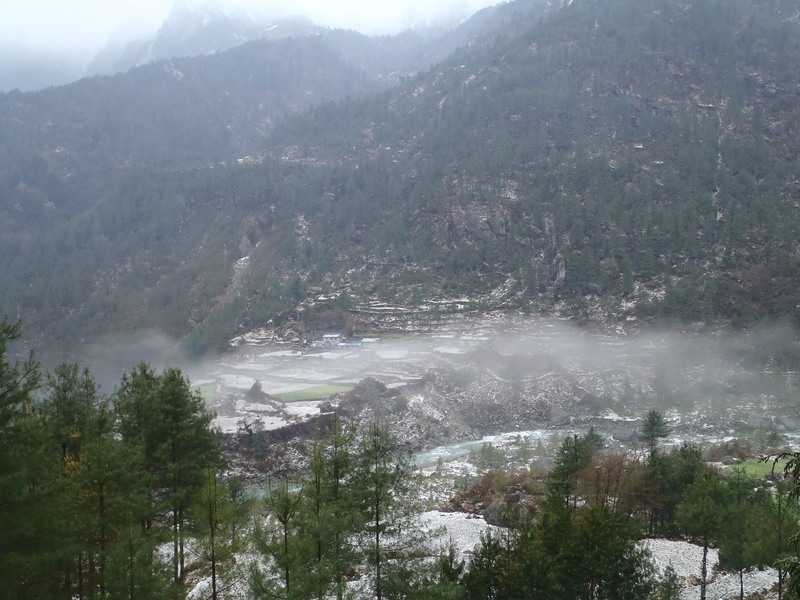 My husband and I did the Annapurna Circuit a few summers ago, and we are eager to get back to Nepal to do Everest Base Camp and the Mustang Trek. Thanks for sharing!